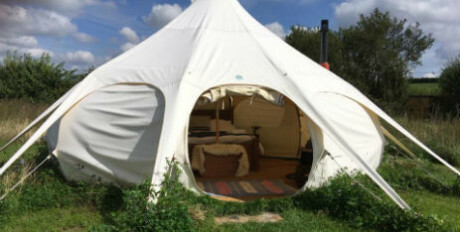 Our Glamping in The Cotswolds is in Belle Tents at Hill Farm near Stratford-upon-Avon, Warwickshire. 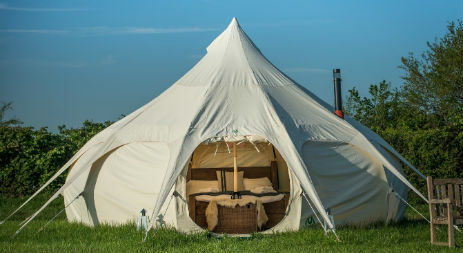 We are a luxury glamping retreat set in the middle of our 450 acre working farm, and offer a friendly and peaceful holiday for couples and families seeking a relaxing break. 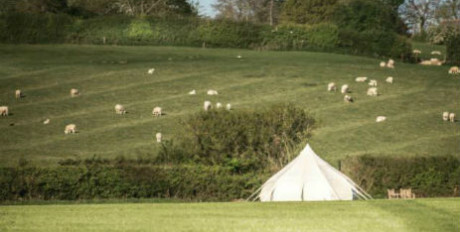 Perfect for anyone who enjoys the countryside, we’ve thought of everything to make your stay as comfortable as a boutique hotel, except outside your hut or tent lies rolling hills and unspoilt countryside. We are just 56 minutes on the train from London to Banbury station, and easily accessible by road. 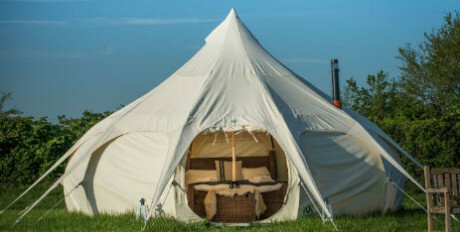 Stay in one of our two fully equipped Lotus Belle tents, Mackies and Upper Navy, named after the fields where they each live at Hill Farm. 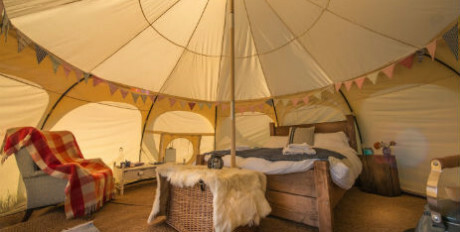 The bell tents each have king sized beds and thick duvets, so you can snuggle into a warm bed. At the heart of the tent is a wood burning stove, keeping you warm in all weathers, and will also make you a cup of tea or hot chocolate. We provide firewood to get you started, and can deliver more to your tent if you run out. All towels and linen are provided. Outside your tent are deck chairs and a kadai fire bowl, where you can toast marshmallows or use it to stay warm while you stargaze. Each tent has it’s own secluded area of the farm with a solar lit path at night, and an ingenious private eco loo just seconds away. A short walk from both tents is an outdoor heated shower and changing hut set amongst the trees. 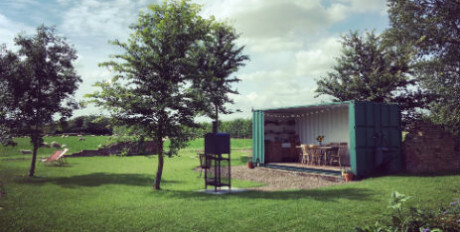 Cooking facilities are found in a converted shipping container called ‘Ox Hovel’, which homes a small kitchen, table and chairs, and a garden oven for cooking. 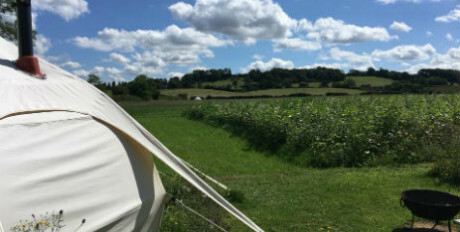 There is plenty of things for our guests to do – from walking either around our farm or the Oxford Canal towpath, a picnic on our hill, cooking your own delicious barbecues (there is a vintage sheep trough with herbs) walking to one of the local pubs, sitting in a deckchair and listening to the skylarks, reading, bird watching, playing croquet, or even going on a bike ride (vintage bikes supplied but not helmets!) 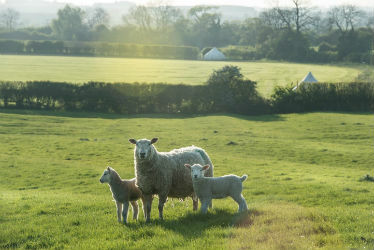 if there are more than two of you, you could also book the other shepherds hut and bell tents for friends! Hill Farm is a traditional mixed family farm, based around the medieval village of Priors Hardwick, on the Warwickshire/ Northamptonshire and Oxfordshire border. It is 450 acres with the Oxford Canal cutting through the farm. The farm has been in the family since 1938, and we farm arable crops as well as having a large sheep flock. The farm is on a higher level stewardship scheme so we leave grassland strips around all the arable fields and allow wild flower margins which encourages an abundance of wildlife – hares, pheasants, deer, foxes and more… it’s also wonderful for bird spotting, especially tree sparrows and yellow hammers. To the East lies Althorp and the Silverstone Circuit. For those with sporting connections, there is eventing at Aston le Walls, Upton and Purston horse trials, racecourses at Stratford and Warwick, point to point meetings at Mollington, polo matches at the Dallas Burstson Polo Ground, golf at Hellidon Lakes, and Rugby Union at Northampton Saints. We are also close to Cropredy for the Fairport Convention, within driving distance of Warwick and Kenilworth with their historic castles, Leamington Spa, the historic market town of Stratford-upon-Avon and all its Shakespearean connections and numerous pretty Warwickshire villages.